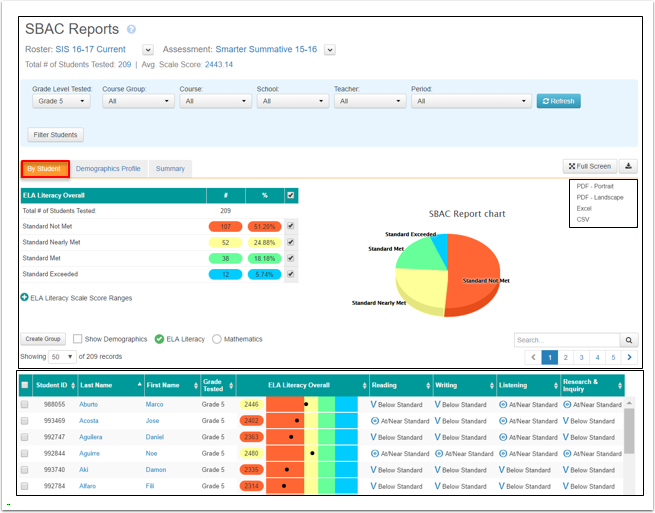 The SchoolCity Suite provides a wide variety of both predefined and specialty reports to quickly and easily analyze the data from assessments and help target instruction to best meet the needs of all students. This document provides an overview of the Report Manager and the types of reports available. Please refer to the specific Help document for each report for detailed information. The default setting shows the list of Predefined Reports under the orange tab (1b). The rest of the report types are listed in alphabetical order. Some report types are specific to SchoolCity roles, the state in which you reside, and/or your district. From the Launchpad, click on the REPORTS flip card. On the flipped side, use the left/right arrows to find the specific report you wish to view. There are nine Predefined Reports. These are automatically generated depending on the type of assessment data available. Not every assessment will have all nine reports. For example, if an assessment is not aligned to standards, a Standard Analysis Report will not be generated. Each Predefined Report is listed with a description of the types of data it includes. To view a report, click on the Predefined Report Name (in blue) or on the View icon (eye) to the far right. Each report displays the roster and assessment, plus summary information under the Report title. Users can use the filters to search for a specific group of students. Scroll from one report to the next by clicking on the tabs. Note that each report can be exported to PDF, Excel, and CSV by clicking on the download icon. This report allows users to view a roster of students for a particular course or classroom, including demographics. Users can select filters including grade level, course, etc. Users can create student groups. Class rosters are refreshed every 24 hours by SchoolCity, as determined by the district’s Student Information System. The last roster upload is shown in black type. This report can be viewed full screen and exported to PDF, Excel, and CSV. This is a specialty report that must be created by the user. It is a report of two or more data sets across the same or multiple years for side-by-side comparison. 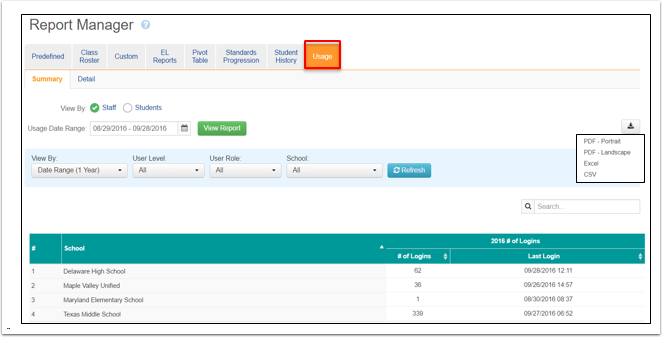 District and School level users can create a report and keep the view Private (only the creator can view), Semi-Private (only selected users can view), or Public (all users can view). The example below shows a list of previously created reports. Click on the View icon (eye) to view a report. 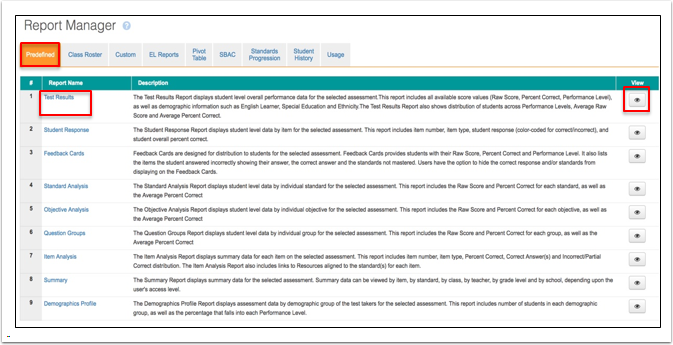 The Custom Report can be viewed by Student and in Summary formats. Show All Students (all students who one or more tests) or Show Matched Students (all students who took all tests). This report can be exported to PDF, Excel, and CSV by clicking on the download icon. (California districts) This specialty report is for Admin, District, and School level users for state reporting purposes. Select the School Year, Roster, and Reporting Year, then School, Grade, Course, Teacher, and/or Period. Includes AMAO 1, AMAO 2, and ELSSA, By School, By Grade, and By Teacher. Click on the download icon to export the report to PDF and/or Excel. This is a specialty report that must be created by the user. It compares student performance across the same, or two similar assessments. It shows student growth, maintenance, or decline from the first administration of the test to the second administration by performance levels. The Pivot Table can be viewed in various ways: Linear/Detail, Linear/Summary, Differential, and Pie Chart. The Key shows the color coding for Decreasing, Maintaining, Rising, and Totals. Once results are released by the state, three SBAC reports may be populated for CA districts - SBAC By Students, SBAC Demographics Profile, and SBAC Summary. SBAC By Students: This report displays the overall performance of each student on both ELA Literacy and Mathematics, including overall scale score and performance level, and claim performance level. Click the radio button next to Mathematics to view those results. 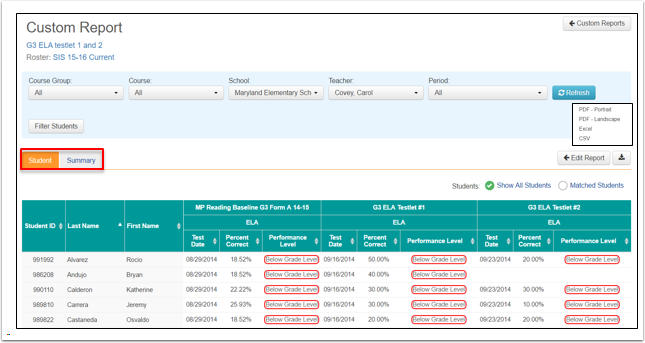 The SBAC reports can be exported to PDF, Excel, and CSV by clicking on the download icon. SBAC Demographics Profile: This report displays results by demographic group in Summary format, By School, By Grade, and By Teacher (for District level users). Align: View the total number of students tested and percent of students below proficient (red and yellow bars) and above proficient (green and blue bars). 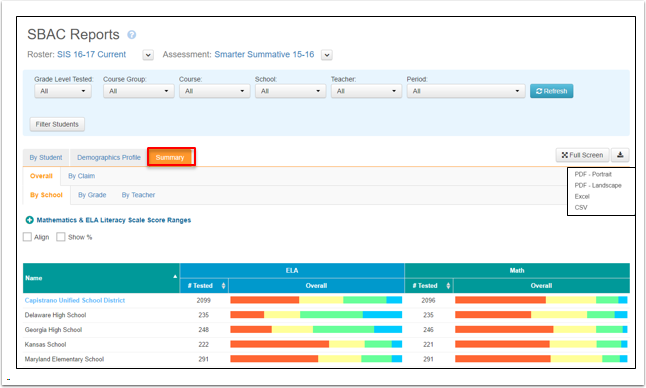 SBAC Summary Report: This report displays Overall results by School, by Grade, and By Teacher, and By Claim results by School, by Grade, and by Teacher (for District level users). 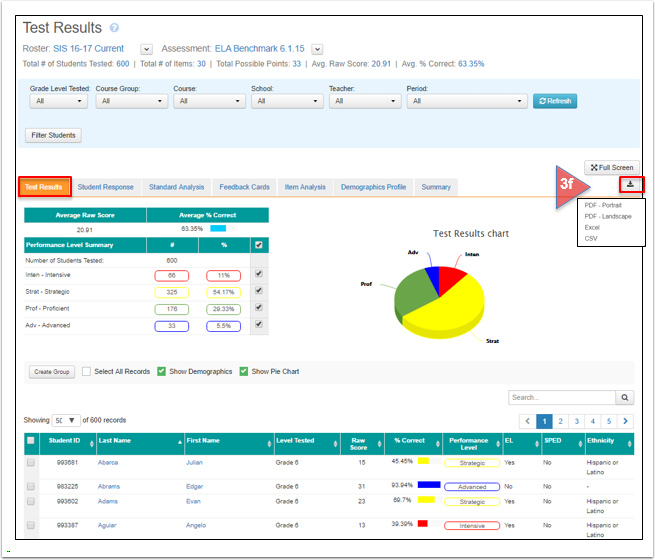 Align: View the overall results with the total number of students tested and percent of students below proficient (red and yellow bars) and above proficient (green and blue bars). Show %: View the total number of students tested and percent of students in each performance level. This is a specialty report that must be created by the user. This report shows student mastery or non-mastery of one or more standards on one or more assessments. The example below was created by a Teacher level user, so the report is automatically private. However, District and School level users may decide to keep a report they create Private, Semi-Private, or Public, like the other specially created reports. Click on the View icon (eye) to view the report. 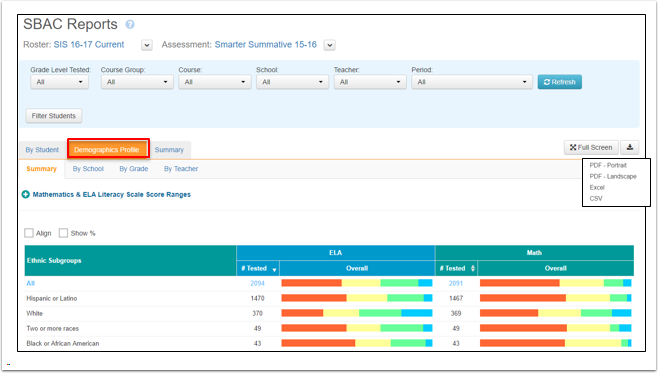 View student results by Detail or Summary on the Latest Assessment, All Assessments, or All Assessments & Average (depending on District Default settings). The Student History Report contains historical data of state and local assessments for each student in a district. Depending on the district, this may include multiple years of results from state tests, English Learner assessments, diagnostic assessments, and district, school, and classroom level assessments. It may also include the student’s class schedule, along with demographic information. Search for a roster by Student or By Class. Click on the magnifying glass icon to view an entire roster. Or enter a student’s first or last name or ID number in the search box, then click on the magnifying glass icon to view only that student’s report. Click on student’s first or last name to view only that student’s report, or click on the View icon (eye) to scroll from report to report. View specific information about the student. Search for specific assessment results. Click on the tabs to view All Assessments, Local Assessments, STATE Assessments, Standard Progression, and Class Schedule. This report can be exported to PDF by clicking on the download icon. This report is generally restricted to Admin level users. It shows information about Staff and Students and their use of SchoolCity Suite. View a Summary or Detail report. View By Staff or By Students. Determine the Usage Date Range. View Number of Logins and Last Login. This report may be exported to PDF, Excel, and CSV by clicking on the download icon.